Queens system--Awake and make out with your Goddess! Many players have enquired on how to activate the Queens system and how to gain affection from the Goddesses. Now we shall make a detailed explanation to our Queens system. In ancient times, Goddesses with beauty and intellect were always worshipped by the people. In this game, different Goddesses also have a variety of skills. You can interact with your Goddesses to increase the Affinity Level, and when there is sufficient Affinity, awaken the Goddesses and win their love. The Queens system will be activated when player reaches Level 8 and has completed the storyline at the 3rd Tribunal. 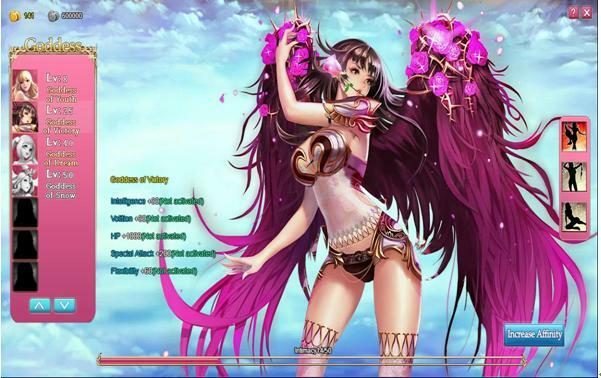 Click on the Goddess button at the bottom of your main screen to enter the Queens system. And the page you should see after awakening the Goddess. 1. Each Goddess will have her own set of prerequisites for activation. As you progress and level up, the corresponding Goddesses will be activated. 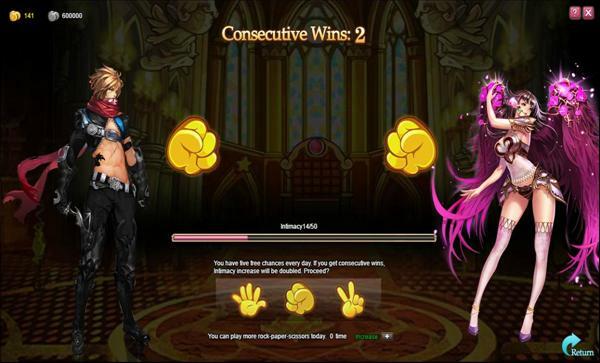 You can play scissors-paper-stone with your Goddesses to increase Affinity, and when Affinity reaches maximum, you can proceed to awaken the Goddess and acquire attribute bonuses. 2. You can game with your Goddess 5 times per day. 3. Each win in the scissors-paper-stone earns you 3 Intimacy points, where a loss earns you only 1 point. Draw does not count. 4. Consecutive wins earns you exponentially higher Affinity points. However, if one loss goes in between, the number of consecutive wins will be reset to zero. This number will also be reset once you reach 24 consecutive wins this day.